The USDA Specialty Crop Block Grant Program (SCBG) program is a competitive grant program, solicited once a year, which funds market research, market promotion and new technology projects specifically to benefit specialty crop producers. The Commissioner of Agriculture, Conservation and Forestry and a Review Committee select projects to fund through a local, competitive proposal process. Selected projects are submitted to the USDA for review, and the Maine DACF administers the Specialty Crop Block Grant each year. Grants typically are provided to projects that will help a number of businesses, rather than support individual businesses. Since 2006, the Specialty Crop Block Grant Program has awarded over $5.2 million dollars to the Maine DACF to support the growing number of specialty crop producers who are selling into local and regional markets. Each year, the Maine DACF accepts applications for Specialty Crop Block Grants, evaluating proposals in a competitive, statewide process. The program provides federal funding to projects identified as critical at the local level. Past and current awards have supported research into Maine’s most crucial agricultural commodities, development of pest management strategies, school initiatives, and food safety projects. University of Maine $70,539 Developing Sulfur Recommendations for Maine Potato Growers The University of Maine Cooperative Extension will develop sulfur recommendation for Maine potato growers to improve Maine potato yield and quality. Objectives of this study are to create robust sulfur recommendations, with multiple sites that will include varied soil textures, soil moisture, and weather conditions. Yield, quality, soil moisture, weather data, uptake, tissue sampling, and soil physical, chemical, and biological data will be used for this study. Maine Potato Board $100,000 Scaling Up Alternative Crop Production in Maine Potato Cropping Systems Over the past 3 years the Maine Potato Board (MPB) has taken a lead role in promoting and researching alternative cash crops and cover crops that can be successfully grown in conjunction with potatoes. Improving soil health and conservation and producing alternative cash crops continue to be high priorities for potato producers throughout Maine. Growers who have adopted longer potato rotations are realizing the environmental and economic benefits that accompany these diverse cropping systems. University of Maine $99,571 Maine Potato Integrated Pest Management - 2019 The management of insects, diseases, and other pests is integral to sustaining the $500 million Maine potato industry. Without reliable and sustainable pest management strategies, potato growers face the potential for severe crop losses resulting in significant reductions in profits and threats to long-term viability. To ensure an adequate response to the pest-related hazards confronting potato growers, the University of Maine System, acting through the University of Maine Cooperative Extension Potato Integrated Pest Management (IPM) Program, will provide support through field monitoring, disease forecasting, and distribution of educational materials. University of Maine $43,887 Effects of Phenology and Fertilizer Applications on Wild Blueberry Production and Pests The Wild Blueberry Commission (WBC) is proposing a University of Maine project to study the Effects of Phenology and Fertilizer Applications on Wild Blueberry Production and Pests. Many of the new fertilizers on the market used by wild blueberry growers have not been evaluated for their impacts on weed and disease pressure. This project will evaluate the response of the wild blueberry system to these new products. Further, increased climate variability has already altered crop growth and pest pressure, requiring research on timing and techniques for revised fertilizer applications. University of Maine $99,880 Improving blueberry production with IPM for Weeds and Diseases The Wild Blueberry Commission (WBC) will work with the University of Maine project to develop and implement a weed and disease Integrated Pest Management program that takes cost and efficiency into account. 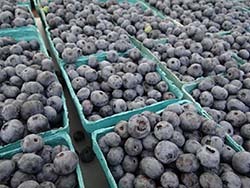 There are 510 wild blueberry growers in Maine managing 44,000 commercial acres. This project would prevent $32.6 million in annual grower losses and sustain $128 million in value added economic activity per year to Maine. Over the past several years wild blueberry growers have consistently ranked controlling weeds and diseases as two of their top concerns for sustaining crop production and yield. Maine Landscape & Nursery Association $52,070 Plant Something at School. Outreach Program to Maine's PK - 12 students in Support of Maine's Nursery and Landscape Specialty Crop Industry The Maine School Garden Collaborative (MSGC), a group of four partners, consists of Maine Agriculture in the Classroom (MAITC), ReTreeUS, Maine School Garden Network (MSGN) and MELNA. This program has developed as an offshoot of MELNA’s successful Plant Something! Plant ME! (PSPM!) marketing effort supported by SCBGP in the last three years. This coordinated outreach will include new resources for school gardens, newly planted school orchards, and the publishing of a new children’s book in the "Agriculture for ME" series promoted with the "Plant Something at School!" marketing vehicle. AgMatters, LLC $42,963 Keeping up with the Produce Safety Rule AgMatters LLC will offer all Maine specialty crop growers opportunities to be made aware of the Produce Safety Rule of FSMA and guiding information as they take steps to implement it. AgMatters LLC will update growers as the law evolves, offer guidance to growers of options they may have, and serve as an information funnel for those looking for solutions to issues they may need to resolve to be compliant. AgMatters, LLC $29,163 Food Safety Planning AgMatters LLC's "Food Safety Planning" will provide growers the training and understanding needed to streamline recordkeeping processes that will meet GAP standards as well as the Produce Safety Rule. "Food Safety Planning" is for all farms in Maine to help them to determine what they need to log and keep track. It will also guide growers to examine these records that they are mandated to keep and glean information from them that may inform their business decision making. For further information about the grant program, applications, or current projects, contact us at (207) 287-3491 or email dacf@maine.gov.